These pages are about iChat®. 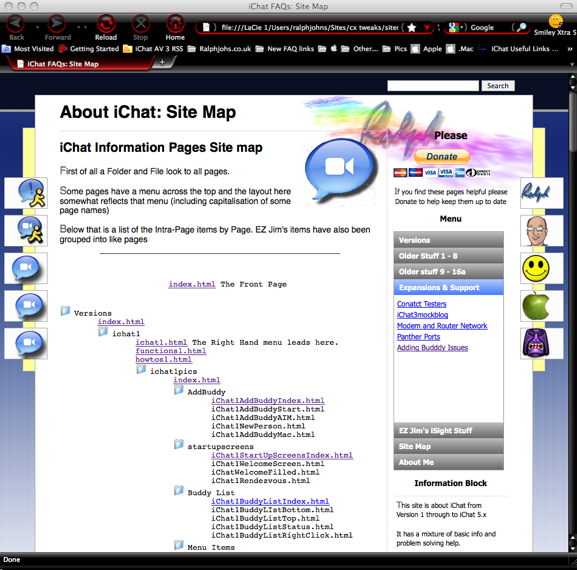 They consist of older info about iChat 1, 2 (AV), 3 and 4 as well as new stuff about the latest incarnation, iChat 5. The basic info from the previous layout remains and has been updated. iChat Versions, with each containing links to Functions, How-tos and Pics for that version. How-tos. A common set of How-To for each of the main functions of iChat such as adding Buddies and Starting Chats. UK Resident. Apple Discussion Board Poster. Apple Enthusiast but not a zealot about it.